A Limited Edition of our Protein Moisturizer for Face & Hands - packaged in a beautiful, portable jar. Perfect during dry, cold, winter weather! Our Valentine's Day gift to you with minimum $40 purchase! As always, Nonies provides a great product that I have used for years and the service is first rate. 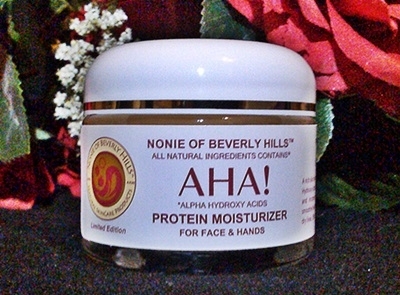 I love the brilliant moisturizer product for normal combo skin and there is nothing that works as well on my face. I have been using Nonie products for several years and love the fact that all of Nonie's products contain only natural ingredients in glass containers! What makes this even better is that my skin looks and feels healthy and hydrated, even at age 68!